Arriving together at fermentation, the purified cane juice and liquid which was separated in sugar fabrication (sugar which didn't crystallize), are mixed and have yeast added in fermentation tanks. The action of the micro-organism transforms the sugar into ethanol, until it reaches an 8% content in the fermented liquid, which is then sent to distillation. Through evaporations and condensations in various stages, it reaches a concentration of 93.3% in hydrous ethanol, which is used as fuel for Flex vehicles. For conversion into anhydrous ethanol, at Renuka do Brasil the hydrous ethanol is passed through a molecular sieve, where the water molecules are captured in special resins generating a product with 99.6% ethanol content. Anhydrous ethanol is the type added to gasoline, in amounts which vary from 20% to 25%. 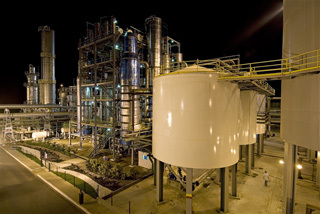 Due to the purity allowed by the molecular sieves system, Renuka do Brasil is able to produce to rigid ethanol standards which meet practically any specification in Brazil or abroad.